In my first company, Lottaperuker, I developed a wig manufacturing business in South Korea. I imported and then sold these products through our own outlets in Sweden and through agents and mail order. The company became a major success in a short time. The IT companies Impdata and Lap Power, the latter of which was publicly listed, were fast-growers. 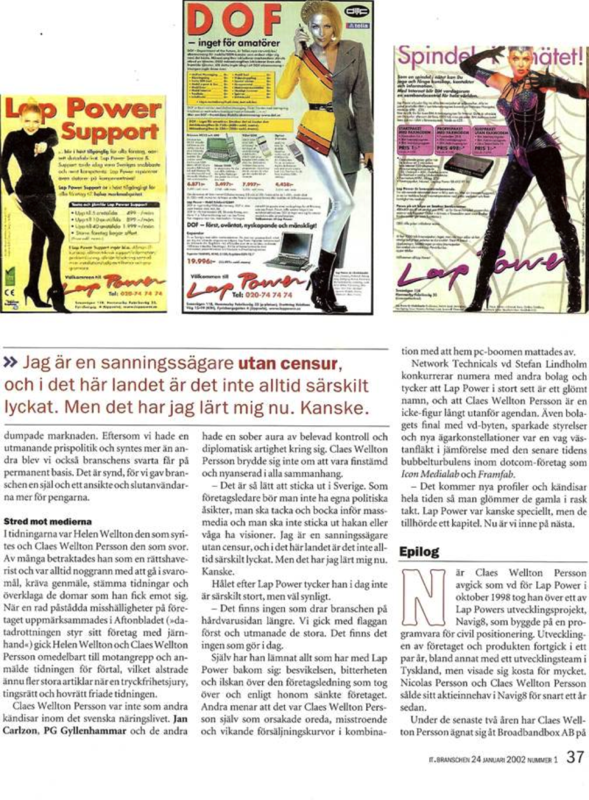 Lap Power was even named Sweden’s fastest-growing company and Swedish Stock Exchange Company Winner on the Stockholm Stock Exchange for a couple of years in the 1990s. The company ICCM was a development company that founded the world’s first factory for the production of low-radiation monitors (Taiwan) in the late 1980s. As ICCM technology was unique at the time, initially we had “all” the major companies around the world as customers, including IBM, but despite this global interest, ICCM was only a modest financial success. 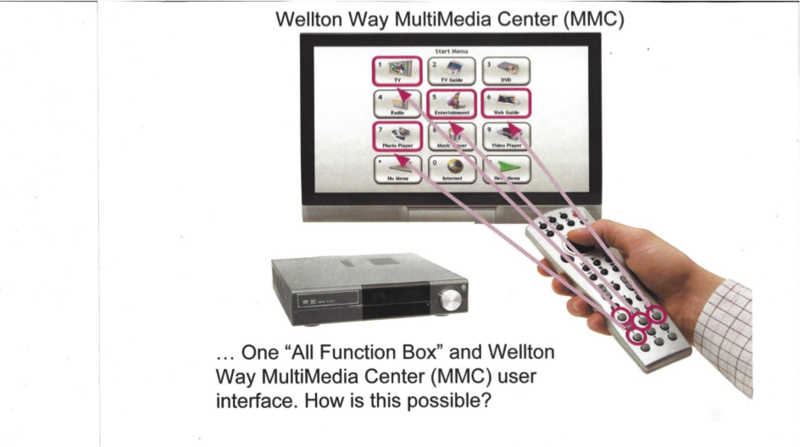 The company Wellton Way was not a financial success, quite the opposite, but it was still a pioneering company that concluded an agreement in 2001 to use my patent US 7,812,823 B2, which included the kind of “icon buttons” now found in all smart TVs and smartphones. Intel, Microsoft and other global companies showed a major interest in the early 2000s in trying to take advantage of Wellton Way and my newly-created “button technology”. I naturally could not afford to initiate legal proceedings against all of these giant global companies that were infringing my patent. 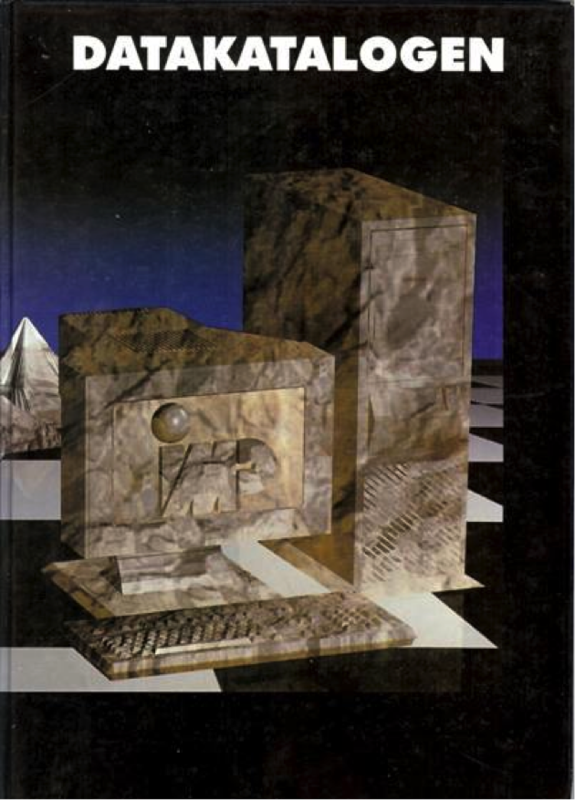 In 1994 I published a little book about the Internet and the future. Computers were fairly new devices and few people understood the future significance of the Internet. 200,000 copies of this little book were published in Sweden. I gave away the publishing rights for free to all who asked, so the book was quickly translated into several languages. Companies and organisations, armed forces and police forces, universities and schools all over the world used the book as an educational aid. Now my working days are a little shorter, just about 10-12 hours. My interest in social debate has meant that I often think about what you can actually do in practice to “solve the world’s problems”. For many years, for example, I have been thinking about how we could produce hydrogen in a simple, cheap way – a thorny problem. It was these thoughts about hydrogen, combined with my amazement and engagement about all the untruths in the climate debate that gave me the idea of the invention of Nano Towers, www.nanotowers.com to extract hydrogen and methane. My love and wife since 16 years, Elena, has strongly supported me during this work. One pleasant feature of my life is also getting involved in my wife’s interest in using the plants and herbs found in nature as beauty products instead of the chemicals used by the cosmetics companies. She has even written a good, attractive book about this, www.stayyoungnaturally.se it’s also fun when my (adult) children occasionally need their old dad’s “words of wisdom” in their own unique companies. During my life I have produced a lot of business but also “produced” many children; they have been supporting me to produce this Homepage, graphics and animations etc, many thanks to them and other supporting friends. 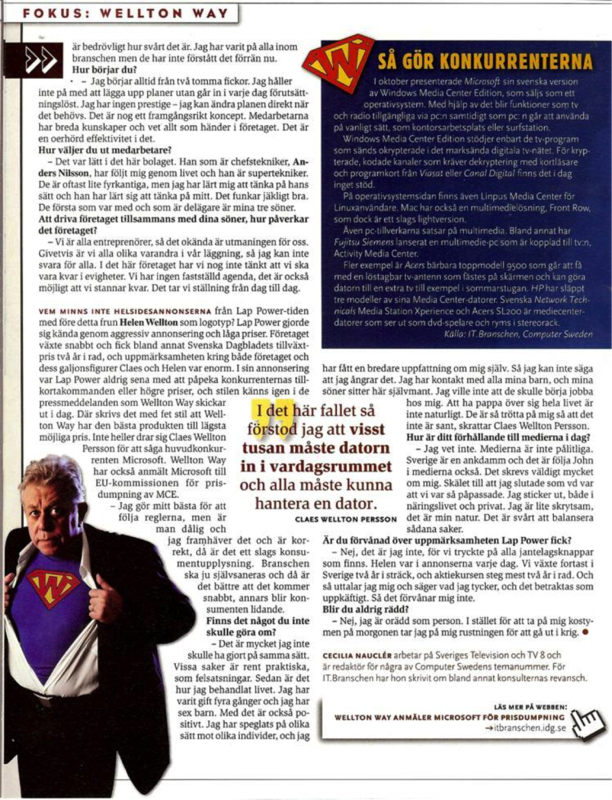 Here is an old Swedish presentation from 2013 and some media comments/articles from 2002 and 2005. 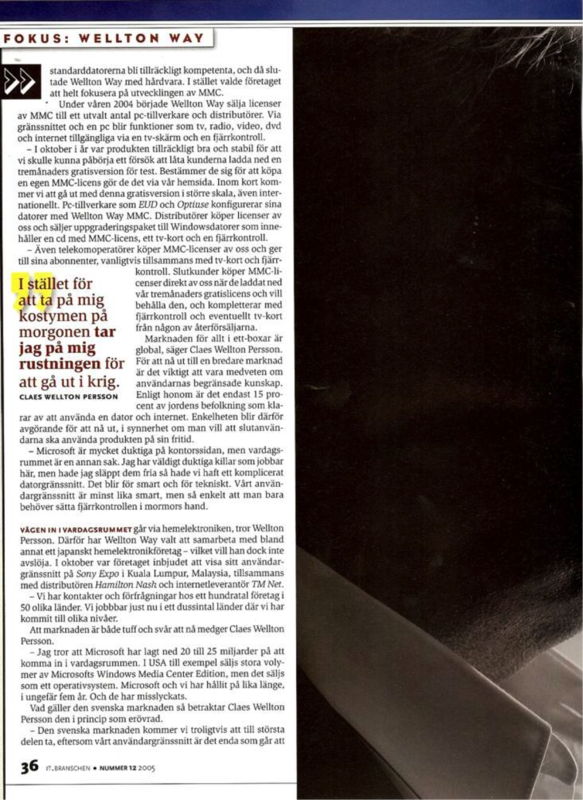 After following the initial presentation and business history are some pictures / magazine articles in Swedish. Lotta Wigs 1968-1978 became a well-known company with several stores around Sweden that sold wigs to ”all” Swedish women, including artists such as ABBA and others. Besides Lotta Wigs I founded several companies during 1970-1980, from small high tech company that developed and sold zinc air batteries, ytvärmeväv and analog computers ferrit-memories, to many other companies that developed and / or sold kitchen tools, roller skating, fire extinguishers etc. Telecom company CPO Telecom 1980-1986. When the Swedish government eased the telecommunications monopoly, I founded my telecom companies. The company was in the forefront of technology development and was initially very forwardly. Then came, however, a terrible story. In 1981 discovered that my competitor, the State Telecommunications Authority (Swedish Telecom) routinely engaged in serious tax, accounting serious crime and many other very serious crimes. The State Telecommunications Authority proved to be Sweden’s biggest crime syndicates. My revelations quick traded by the Swedish Government, which is also my advice began to accelerate the abolition of the telecommunications monopoly. JO was the only authority that condemned the Telecommunications Authority and the Telecommunications Authority boss very offensive statements on me. JO was therefore obviously eventually fired. Sweden protects and frees officers and judges often each other in serious breach of the law, it is called the ”Swedish model”. Telecommunications Authority continued despite my revelations of his criminal activity for six years. Tax Agency, police, prosecutors, courts and others refused during these six years consistently to follow the law. These government agencies tried instead to judge and imprison me, the messenger; I revealed that the gross violations, as well as the huge – unrecorded multibillion scrolling, within its authorities and its managers. 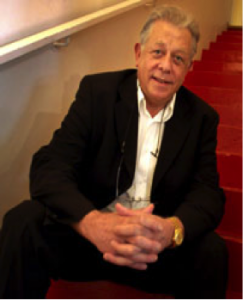 Televerket director later moved to Switzerland. I was forced to give away my telecom companies. Even today, no one knows where Swedish people billions went as JO were not conclude its investigation. Data Company Impdata 1986-1990. When IBM introduced its PC in 1981 began computers become popular. I founded because Impdata which became Sweden’s fastest growing companies. During the 80’s ”beaming” and monitors so much that it became more or less ”tanned” in front of the computer screen. We built a factory in Taiwan, which was first in the world to develop and produce low-radiation monitors. The factory had 250 employees sold low-radiation monitors to ”all” major companies, including IBM, Philip, Ericsson, Olivetti. Industrial and military computers PCQT 1989-1991. The knowledge to build low-radiation monitors were helpful when we founded PCQT. PCQT developed special computers for tough environment for the use of military forces, industries and others. PCQT later became a listed company. Data Lap Power Company from 1991-1999. When computers began to be portable I took the opportunity to start Lap Power and specialized me on laptops. Although she was fully clothed, she was considered, because she was a woman, to be too challenging for public allowed to occur with a computer. This ridiculous and misogynistic precipitation had spread globally and was under the Foreign Ministry Sweden’s biggest international news made in 1991. 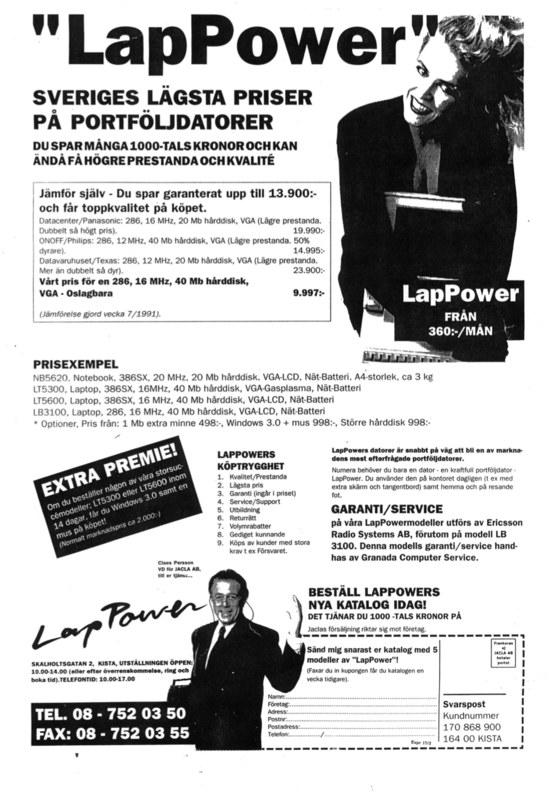 Lap Power entered the Swedish stock exchange in 1994. 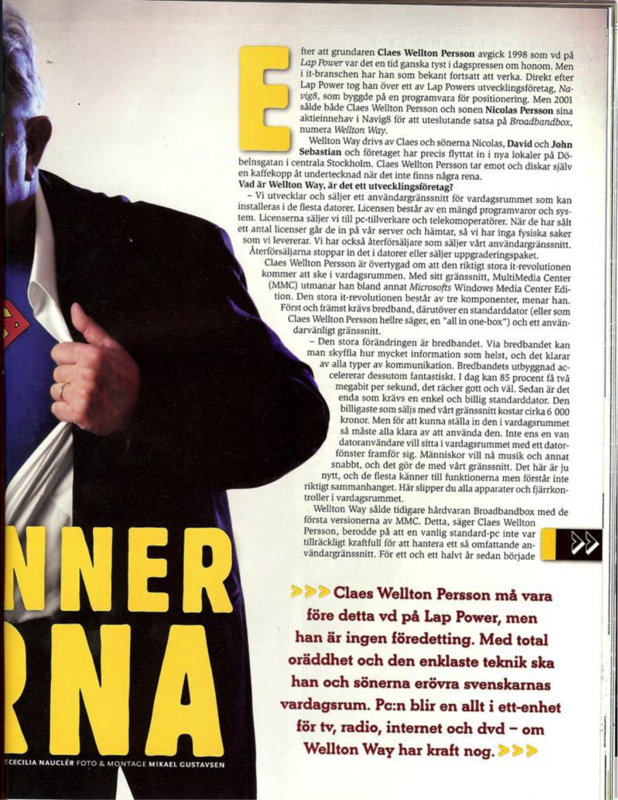 Lap Power became in a few years Sweden’s fastest growing companies, and also the overall winner of the Stockholm Stock Exchange. In late 1996 sold Lap Power most Internet connections in Europe. Lap Power yacht won in 1994 one of the world’s largest yacht race, Round Gotland. Since my promotion was effective, I also commissioned to take care of a lot of the marketing for companies such as Microsoft, IBM, Telia and others. Hard work brings success breeds admiration, but also, unfortunately, hatred and slander. 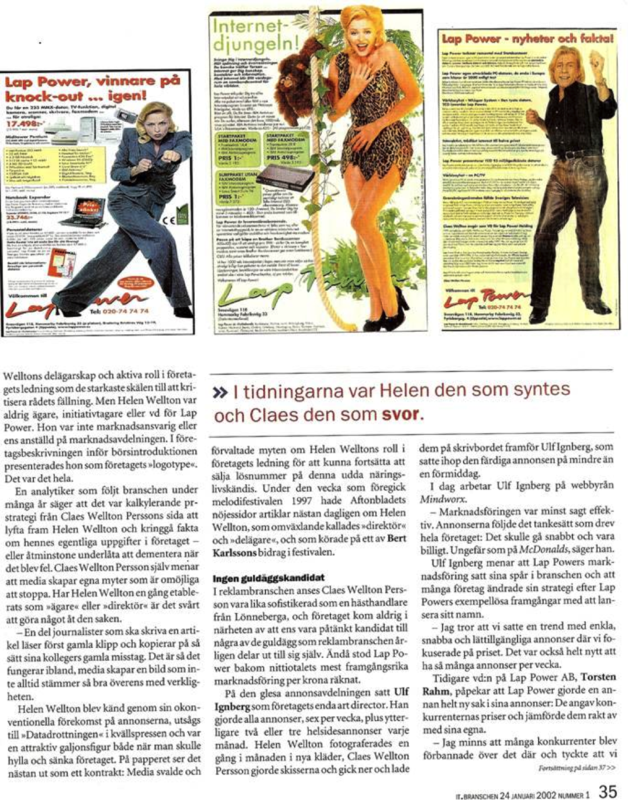 My then wife and I were therefore 10 in the top list of the most publicized and talked about in Sweden in the 90s – for good and bad. Awareness of the accelerating integration of computers, televisions and mobile phones made me interested in developing an interface including all the different technology. I applied for a patent US 7,812,823 B2 for a button interface 2001 (see below picture), the type of buttons / icons and functionality that are now available on most mobile phones such as the iPhone and in modern televisions. The company developed rapidly and brought on the Deloitte Fast 50 list in 2004 (second place). Wellton Way also received first prize in its class at the awards Deloitte Fast 500 in Paris in 2006. Initially searched Microsoft and Intel work closely with Wellton Way. Microsoft was also Wellton Ways largest customer in 2000. Partnerships were discontinued in 2003 when Microsoft unveiled a bad copy. Wellton Ways Interface has then, in later years, been copied surprisingly unimaginative of the major global companies. Wellton Ways Interface was unique, but Wellton Way simply lacked the financial muscle, and the very ”special business ethics” that was needed to be able to compete with some of the world’s largest companies. Below image: Impdatas directory published twice a year, and was then, in the 80s, the computer industry “bible” . Pictures of the book cover. In the 90s, computer sales exploded, everything written about technology. Very few realized that we were facing a cataclysmic global revolution. I therefore wrote a little book 1994/1995 on how computer technology would change our whole society, not only technologically, but above all politically and sociologically. The book had a great impact and changed the debate. It was used in teaching, not only in schools, even among the military, corporations, police and others, in Sweden and abroad. 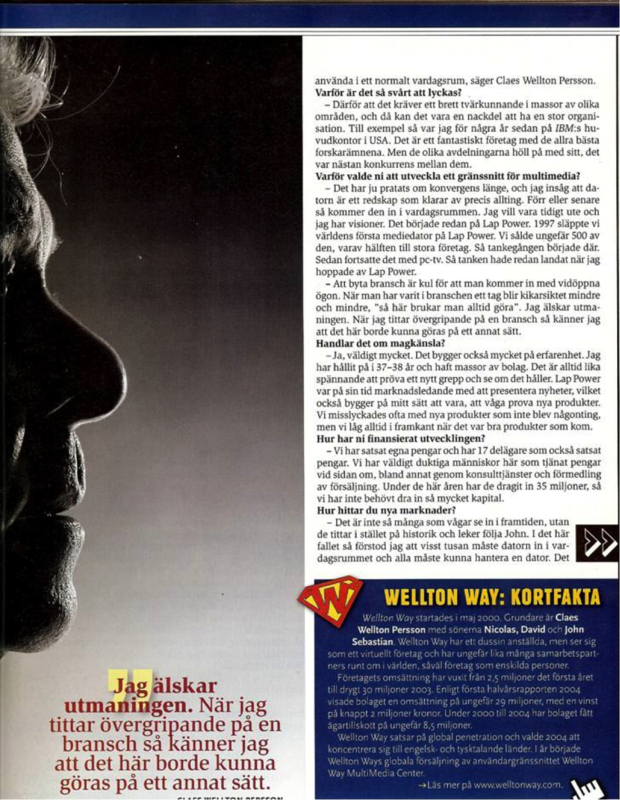 In Sweden, edition 200 000 ex. The book was also translated into several other languages. IDG International Data Group is a publisher of IT-related information. IDG was founded in Boston in 1964 and is available in 85 countries. It publishes more than 300 computer magazines around the world. Below is one of many articles about my company Wellton Way. 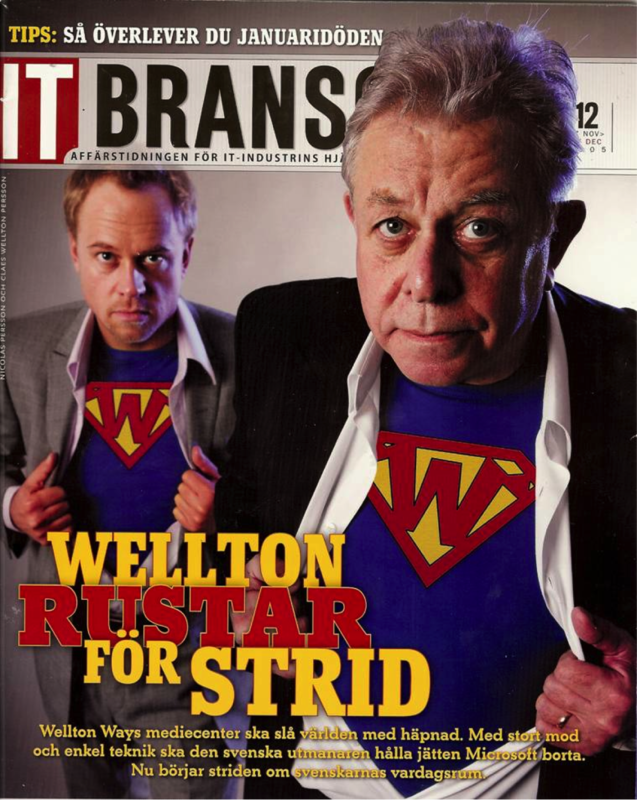 ”Wellton prepares for battle.” Claes (Wellton) Persson. Also IDG media. IDG has given me permission to use the above articles in my presentation. Presentationen är tryckt och mångfaldigad av Claes Persson i Stockholm 2013. Copyright; IDG och Claes Persson 2013.